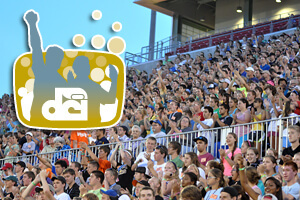 The DCI Fan Network presents its second live webcast of the season Friday, June 28 from DCI Central Indiana in Muncie, Ind. With the first corps stepping off at 7 p.m. ET (4 p.m. PT), you'll be able to watch the full performances of some of DCI's top corps online in real-time, webcast using multiple cameras. Webcasts typically begin 30 minutes before the first corps performs. The lineup includes: 7:00 p.m. Troopers 7:17 p.m. Colts 7:34 p.m. Blue Stars 7:51 p.m. Spirit of Atlanta 8:08 p.m. Crossmen 8:25 p.m. Madison Scouts 8:42 p.m. The Cavaliers Times approximate and subject to change. Two ways to view this webcast are available. A $19.95 pay-per-view option will give you one-time access to watch all of the performing corps at DCI Central Indiana. Choose the $69 Live subscription option, or Live+DVD or Live+Blu to gain complete access to all of this summer's live webcasts, on-demand replays of select DCI Tour events, discounts on downloadable media, and more!